HomeAdaptive ClothingTop Ten Great Gift Ideas for Grandparents! Are you looking for that perfect gift for Grandma and Grandpa? Maybe something better than the classic macaroni picture frame? You want to get something that you know they will love but that they can always use. 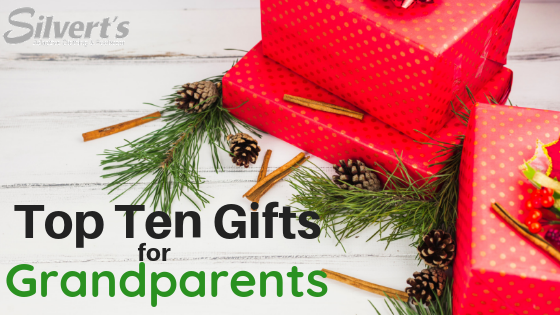 Here is a list of the top ten gifts that you can get your grandparents for Christmas. Dancing and singing along is an amazing de-stressor as well as something your grandparents probably love doing. So here is an easy project for you; buy them an iPod, and create playlists for them. Have some old time classics and maybe even mix in a few of your favourite songs. Keep the songs light and loving, and easy to understand. Do you have an old sweater that your grandmother knit you once upon a time? If they have something they love doing, stocking them up on their favourite craft could be what they need. Whether it be purchasing some yarn or new knitting needles, or even a booklet of patterns for crochet! If they have other activities that they enjoy doing, get them some useful things for their hobbies. This could include; paint, brushes, pencils. Keeping your grandparents comfortable and warm in the winter is both a useful present as well as a very caring gesture. Give them a new pair of slippers to keep their feet warm. Do they have wide or swollen feet? If you notice holes in the sides of their old pair of slippers might be an indication that they might need wide slippers. Look into what they need in a new pair of slippers; get them a nice pair of new cozy slippers for Christmas. Do they not like wearing slippers? A pair of slip resistant socks could keep them safe this winter. Workout equipment, such as bands or light weights will keep them active and strong. Having these things at home means they can keep in shape from the comfort of their own home. Even if they are lifting three pounds while they watch tv, it is an amazing way for them to exercise. Bring out your creative side and make them a scrapbook. This is a great gift from the heart. By making a scrapbook, you are showing that you put time and effort into your present. It will also be a nice activity for you to get the pictures all together. If you need some help putting it together, websites like shutterfly.com are great websites to put the scrapbook together for you! If you aren’t as creative, spend some time looking through pictures and create a photo album of pictures for them. These can be a mixture of old photos of them, you can really learn a lot about their lives by asking parents and even siblings of theirs for photos of them. Try and see if your parents have any photos from when they were kids and add it to the album. Even pictures of you as a kid. The pictures don’t all have to have your grandparents in them. Sometimes those having pictures of their loved ones are even better to look at than their own pictures. Clothing is a staple that they might not know they need. If you find they have had the same top since you can remember, it might be time for a new Christmas top. If you notice they are having trouble holding things, or their hands don’t work quite as well, side opening pants could be a great introduction to their closet. Side opening pants have easy touch fastenings on either side of the pant making it easier to pull the pant up. If they find they are just having trouble with buttons, elasticized pants or a magnetic top could help their daily dressing. If they have assisted dressing, getting them adaptive clothing can be extremely helpful for both them and their caregiver. A wheelchair bound individual can benefit from open back pants which are pants that can be put on while they remain in a seated or laying down position. As a result, this will make it easier on the caregiver and much easier on your loved one when they don’t have to be jostled around every morning while they are being dressed. Adaptive tops are great for those that have limited mobility in their shoulders. For your grandparents, their joints may become stiff, allowing for limited movement of their arms. If this is the case and they require help getting tops on in the morning, these tops will help them a lot. This top is put on like a hospital gown, and with generous snaps on either shoulder, they snap into place so your grandparent won’t have to struggle with putting anything over their head. This gift can be done in many forms. First, give them a calendar with dates that you will be visiting, or dates of events that you want to take them to. This could be as simple as a trip to the mall, or nail salon, or a place they have always wanted to go. Next, you can sit with them to make plans, this gives them something to look forward to and maybe you can find out something that they’ve always wanted to do. Finally, just putting dates that you will take them to run errands could mean the world to them. Neat gizmos are an area of endless possibilities. Get creative! If they live alone, you could get them a self massager or a self back scratcher. These can be funny gifts to make them laugh; make it unique so they will think of you every time they use it. Some other unique gift ideas could be an ihome, or an alexa device. Something that they can ask a question during the day and get a response. Become their pen pal! Get them some cute paper and pens with envelopes. Don’t forget stamps, and give them your address so they have their first person to send a letter too. Add in things you know they would like or that they might need, like a spy glass. If they like to keep lots of things handy, a wheelchair/walker pouch could be perfect to keep everything together. They can keep all of their small items such as dentures, glasses and handkerchief all in the same place. This way there will be no more issues of misplacing things. If they already have a bag to use for their items, a wheelchair blanket will keep them warm for the winter. Even if they just want something to put over their legs, a wheelchair blanket will attach on to either side of their wheelchair so they won’t have to worry about it falling off. Want something a bit warmer for the winter season? Wheelchair capes could be a good gift for them. If you have siblings, everyone could pitch in to get them a winter wheelchair cape, then it will be a nice present from the whole family. This will keep them warm if they are ever visiting family, or if they need to go outside for a doctor’s appointment. They are like jackets that are directed towards someone sitting in a wheelchair. With a higher back, the cape won’t get stuck in any wheels. Give them a gift they will love! These gifts are all very easy to personalize to their taste, or to yours. By giving them something that you picked for them, they will love to see your taste. Making them something connects them to you, by showing them a bit of who you are. They also have something to talk about now, that YOU made it for them. Ask your parents if you need ideas on favourite colours or specifics. Don’t be afraid to ask your parents for their opinions on what your grandparents might like. In conclusion, give them something that will be useful to them, and make them think of you every time they use it.